If you want something done, ask a busy woman. And that saying sums up Gillian Armstrong, site manager at Sovereign Hill’s Narmbool, a 2000ha working farm and tourism estate 28km southeast of Ballarat. Narmbool is a constant hive of activity, with a booked-out school camp, a similarly busy weddings/conference centre and a farm with about 20,000 Merino sheep. Sound busy? Gillian is also a volunteer firefighter at the Elaine CFA and treasurer of her local Landcare Australia group. And the 56-year-old grandmother-of-three looks after grandkids at weekends, all while running a side business making exquisite bonnets and top hats to sell through Etsy. And her spare time? Gillian is in her final year of a Bachelor of Environmental Management at Federation University, and halfway through an Advanced Diploma of Leadership and Management with Monarch Institute. Gillian decided to gain formal qualifications after decades of management roles at Sovereign Hill, including the popular Blood on the Southern Cross sound and light show. She took the site manager job at Narmbool seven years ago with her husband Mick, who manages “all the blokey machinery maintenance stuff, and I take all the administration”. The move from Ballarat to Elaine was supposed to be a tree change, but Gillian is busier than ever. Born and bred in Yorkshire, Gillian came to Australia at 18 and immediately got a job “speed sewing” at a little garment factory behind the bowling alley in Ballarat. 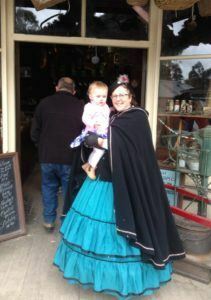 She started working at Sovereign Hill as a seamstress in the costume department 22 years ago, working her way up to retail management. “Now I’m in my dream job,” Gillian says. “I just love it on the farm.“And I can study here with Monarch. The course brings me up to speed with all the latest in management, and I can do it all in my own time, at my own pace. If you’re interested in finding out more about Monarch’s leadership and management course, click here. Or give one of our Course Consultants a call on 1300 738 955.